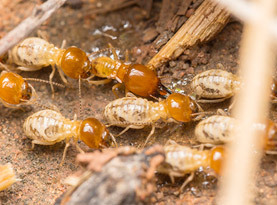 For over 35 years, Animal Pest Management has been providing the residents of Southern California with exceptional pest control services. Our trained technicians have the experience needed to effectively and safely remove any bee problems you have on your property. Because of the risk associated with bee stings, any bee control should be left to our trusted staff. Why Do Honey Bees Attack? Honey Bees swarm primarily when their colony outgrows the hive or the queen bee begins to wane or fail. 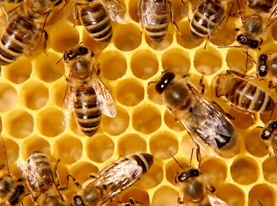 When this occurs, a new queen is produced and the old queen leaves the hive with a large population of worker bees. Swarms first move to tree branch, hollow tree, wall, attic or other temporary suitably sheltered from the weather. Once establish residency in a wall or attic, they need to be removed. Animal Pest Management offers live honey bee removal services and we can relocate them for an additional charge. While carpenter bees don’t pose a large threat to humans, their nests can be bothersome. 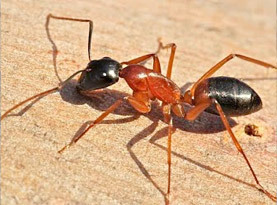 They are usually considered to be loners that build their nests in wooden structures. The damage to the wooden structure isn’t as serious as termite damage, but they do leave behind unsightly holes where they build their nests. Avoiding carpenter bees involves filling in any cracks or crevices of wooden structures with caulking. Painting or varnishing wood will also help you avoid carpenter bees. Bumblebees can be an intimidating insect due to their size alone. They are a very docile creature for the most part. However, while they are docile, they still pose a threat to humans if they feel threatened. One important thing to note about bumblebees is the fact that they can sting more than one time. They usually live in small colonies and should be avoided if at all possible. This aggressive hybrid of the European honey bee and the African honey bee has been a resident of Southern California for decades. Africanized bees are hard to differentiate from honey bees. If you notice a hive that has overactive and incredibly aggressive bees, chances are you have an Africanized honey bee hive and should leave it to the professionals at Animal Pest Management for removal. Animal Pest Management Services understands that bees on your property often need an emergency response. We have a two hour response time for all bee service calls within Orange County and the Inland Empire. One of our urban wildlife technicians will arrive on site to thoroughly inspect the area and provide bee control services. Please note response time may vary in San Diego County and the deserts. 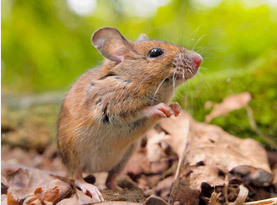 Call Animal Pest Management Services today and talk with an urban wildlife professional to see how we can help solve your animal and insect pest problems with guaranteed results.